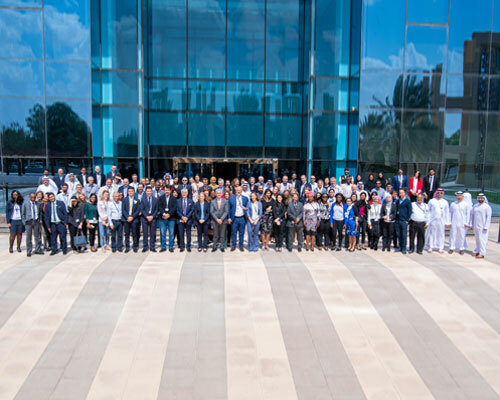 The organizations and companies based in the International Humanitarian City (IHC) came together yesterday for the IHC annual members’ global meeting. More than 100 members and guests attended the event. IHC CEO, Giuseppe Saba, gave an overview of the achievements of 2018, including the launch and replicas of the Humanitarian Logistics Databank, and the development of the Flash Studio Project. The day featured also HE/Dr. Hamad Al Sheikh Ahmed Al Shaibani, Managing Director of the International Institute for Tolerance (IIT), as a keynote guest speaker on the concept of tolerance and the national program of the UAE. Also among the speakers at the event was Mrs. Hind Alowais, Expo2020 Vice President for International Participants, who discussed the plans of Expo2020 and collaboration of IHC Community. Workshops on Expo2020, the Flash Studio, and IHC logistics and services – with the support of Dubai Customs – were conducted in the afternoon sessions. Recognition awards were also distributed to IHC members.